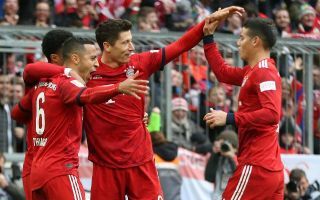 James Rodriguez is reportedly available for transfer this summer as Real Madrid look prepared to sell the Bayern Munich loanee to the highest bidder. The Colombia international has had a difficult few years, failing to live up to the immense potential seen in him earlier in his career. According to Don Balon, Rodriguez is now being tracked by Arsenal and Liverpool, and Real will let him go to whoever comes in with the best offer. The report also mentions Serie A giants Napoli as contenders for his signature, but it would be great to see Rodriguez try his luck in the Premier League. Having previously looked one of the finest attacking midfielders in Europe, the 27-year-old could get back to his best at the right club. Arsenal and Liverpool both look good options to suit Rodriguez’s style of play, with the Gunners in particular need of reinforcements in attack. Mesut Ozil has played less often under Unai Emery this season, while Aaron Ramsey will be joining Juventus on a free transfer in the summer. Liverpool, meanwhile, could also do with more depth in that area of the pitch after a lack of real impact from Naby Keita and Xherdan Shaqiri since they joined this season.